It’s simple to delete contacts from your Mad Mimi email list, it’s also quite permanent. So be careful to only delete contacts that you want to permanently remove from your account. When you delete a specific contact in your audience, you also delete all of the information associated with that contact (sending statistics, list organization information, etc.). This information can’t be recovered even if the contact is re-added to your audience. We recommend exporting a back-up file of your contacts before deleting. In a lot of cases, suppressing contacts in your Mad Mimi account is a better option. Suppressed contacts don’t count toward your active plan total and you’ll retain each contact’s mailing history this way. If you have any questions about how deleting contacts works, or are uncertain whether to delete or suppress, email us at support@madmimi.com, and we’ll help you through it! If you want to just delete a few contacts, one at a time, you can do that by clicking on the trash can icon to the right of their contact information. Choose the list that contains those contacts. 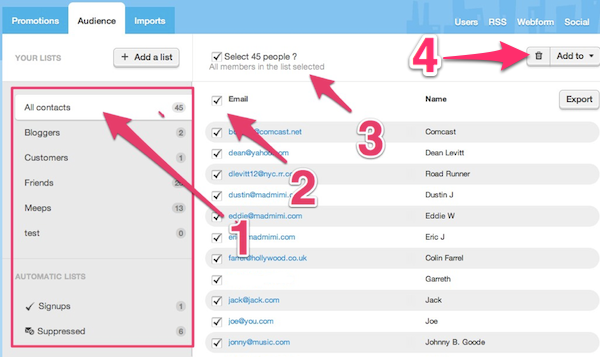 Select the “Email” box to select all of the contacts that are visible on the current page of a list. Select the “Select X People” box to select every contact that is in your currently selected list or search. Once you’ve selected all of the contacts that you want to delete from your search, click on the trashcan icon to delete.